This terse assertion could have profound implications for the ability of computers to solve many kinds of problem. It also answers one of the Clay Mathematics Institute's seven Millennium Prize problems, so if it turns out to be correct Deolalikar will have earned himself a prize of $1 million. The P versus NP question concerns the speed at which a computer can accomplish a task such as factorising a number. Some tasks can be completed reasonably quickly – in technical terms, the running time is proportional to a polynomial function of the input size – and these tasks are in class P.
If the answer to a task can be checked quickly then it is in class NP. So if P = NP, every problem that can be checked quickly can also be completed quickly. That outcome would have huge repercussions for internet security, where the difficulty of factorising very large numbers is the primary means by which our data is kept safe from hackers. But Deolalikar says that's not the way it is. His argument revolves around a particular task, the Boolean satisfiability problem, which asks whether a collection of logical statements can all be simultaneously true or whether they contradict each other. This is known to be an NP problem. Deolalikar claims to have shown that there is no program which can complete it quickly from scratch, and that it is therefore not a P problem. His argument involves the ingenious use of statistical physics, as he uses a mathematical structure that follows many of the same rules as a random physical system. If the result stands, it would prove that the two classes P and NP are not identical, and impose severe limits on what computers can accomplish – implying that many tasks may be fundamentally, irreducibly complex. For some problems – including factorisation – the result does not clearly say whether they can be solved quickly. But a huge sub-class of problems called "NP-complete" would be doomed. A famous example is the travelling salesman problem – finding the shortest route between a set of cities. Such problems can be checked quickly, but if P ≠ NP then there is no computer program that can complete them quickly from scratch. Complexity theorists have given a favourable reception to Deolalikar's draft paper, but when the final version is released in a week's time the process of checking it will intensify. This post originally appeared on New Scientist. 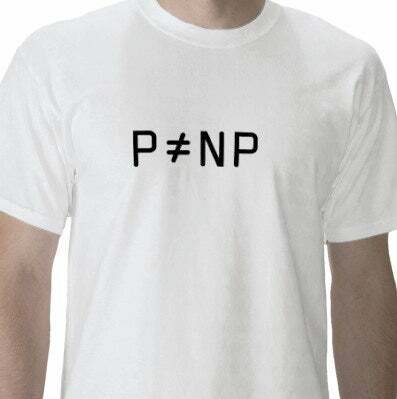 Also, if you'd like to celebrate this day with a P ≠ NP tee, you can pick one up at Zazzle.